Announcement Browse fine art prints, home decor and women's clothing with nature photography, vintage themed art and colorful digital creations featuring cats and dogs. Wildlife photography, whimsical designs and colorful abstract pet portraits on wall art, throw pillows, canvas wraps, shower curtains, womens tops, and greeting card packs. Browse fine art prints, home decor and women's clothing with nature photography, vintage themed art and colorful digital creations featuring cats and dogs. Wildlife photography, whimsical designs and colorful abstract pet portraits on wall art, throw pillows, canvas wraps, shower curtains, womens tops, and greeting card packs. A very nice blouse. Love the vintage map on the front. Fast shipping. Exactly as described. Really like it. I’ve added a new print and a throw pillow of a German Shepherd dog to my shop! I’ve added a print of a cute little Pomeranian dog to my shop! I’ve added a new print to my shop...4 patchwork quilt cats put together to look like a quilt. Something a little different for the cat lover! In this shop I've combined some of my favorite things: nature photography, vintage art, and colorful abstract designs featuring cats and dogs. Growing up, I always seemed to be fooling around with a camera. But it wasn't until I moved to the Sunshine Coast of British Columbia, Canada, that I started taking my photography more seriously. We're surrounded by the ocean, mountains, and abundant wildlife here on the coast. I immersed myself in this incredible beauty and started my photographic career within a year of moving here. And then I discovered vintage art... I love to collect old things. Antiques and anything vintage have always had a special fascination for me. My very favorite thing to collect is anything that's old and on paper...things like vintage illustrations and photographs, handwritten letters, postmarks, lettering, ads from magazines, old Photochrome postcards, fruit crate labels, and flower seed packets. I was looking for a new creative outlet when I hit upon the idea of creating artwork using my collections of vintage ephemera. I enjoy making something new out of something old. I try to tell a story with my vintage collages and I often add an inspirational message. With my background as a nature photographer, I especially enjoy creating nature-themed whimsical art. I create my collages in Photoshop and sometimes even add my own photographs or other modern elements. I try to give my pieces a fun, uplifting feeling. I want you to feel good when you look at my art! I also love creating colorful abstract portraits of cats and dogs. 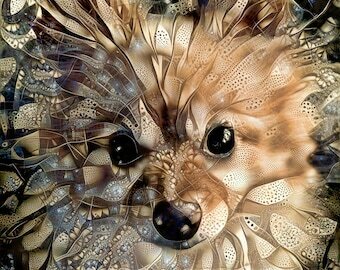 These pet portraits start as photographs but transform into unique artwork that looks great on home decor products and clothing. Enjoy browsing my shop and please check back often because I'm always adding new goodies. Besides being a collector of everything vintage, I'm a professional nature photographer, digital artist, and jeweler. My partner transforms my images into top-quality gallery canvas wraps using archival inks. All canvas wraps come complete with hardware installed so they are ready to hang. 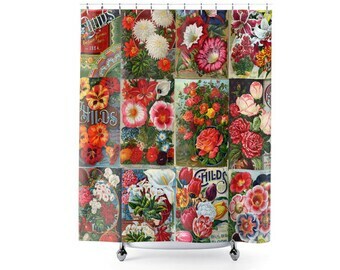 My partner transforms my images into sturdy, attractive shower curtains that will beautify your decor. This photo lab provides top-quality fine art prints using the highest rated archival inks and papers. They enjoy a solid reputation for excellent service at reasonable rates. Sometimes you would rather have art printed on home decor products rather than hanging on your walls. That is where this company comes in. I trust them to print my images on top quality home decor items such as throw pillows. This print shop produces top quality greeting cards and books with brilliant colors on gorgeous thick card stock. ● SERVICE PROVIDERS: I engage certain trusted third parties to perform functions and provide services to my shop, such as delivery companies i.e. USPS. I will share your personal information with these third parties, but only to the extent necessary to perform these services i.e. your postal address. ● BUSINESS TRANSFERS: If I sell or merge my business, I may disclose your information as part of that transaction, only to the extent permitted by law. ● ACCESS: You may have the right to access and receive a copy of the personal information I hold about you by contacting me using the contact information below. ● CHANGE, RESTRICT, DELETE: You may also have rights to change, restrict my use of, or delete your personal information. Absent exceptional circumstances (like where I am required to store data for legal reasons) I will generally delete your personal information upon request. ● OBJECT: You can object to (i) my processing of some of your information based on my legitimate interests and (ii) receiving marketing messages from me after providing your express consent to receive them. In such cases, I will delete your personal information unless I have compelling and legitimate grounds to continue using that information or if it is needed for legal reasons. ● COMPLAIN: If you reside in the EU and wish to raise a concern about my use of your information (and without prejudice to any other rights you may have), you have the right to do so with your local data protection authority. For purposes of EU data protection law, I, Peggy Collins, am the data controller of your personal information. If you have any questions or concerns, you may contact me at: peggycollinsphotoart@ gmail.com. Yes, I do! If you would like a print in a specific size that you don't see listed, just let me know.